SAINT MOTHER TERESA’S FIRST HOLY COMMUNION CHANGED HER LIFE! “These desires to satiate the longings of Our Lord for souls of the poor — for pure victims of his love — goes on increasing with every Mass and Holy Communion” (Saint Mother Teresa of Calcutta). Blessed Mother Teresa of Calcutta was canonized by Pope Francis in Rome on September 4, 2016 and is now Saint Mother Teresa of Calcutta! God is glorified in His saints (2 Thes. 1:10). In this note I will reflect on how Mother Teresa’s first Holy Communion propelled her towards sanctity. Saint Mother Teresa lived an intensely Eucharistic life. Sometimes we get into a rut and we almost begin taking Holy Communion for granted. We must resist this temptation towards tepidity because Holy Communion is a great gift from Jesus – a priceless treasure. One Holy Communion, says Father Faber, is enough to make a saint. Faber says, “No one can tell how much grace lies in a single Sacrament. In a single communion lies all grace; for in it is the Author and Fountain of all grace….” (The Precious Blood, page 116). “Oh how sweet the first kiss of Jesus was! It was a kiss of love. I knew that I was loved and I declared: ‘I love you and I give myself to you forever!’ …on that day it was no longer a matter of gazing: it was a union. There were no longer two of us . Therese had disappeared like a drop of water in the depth of the ocean. Only Jesus remained….” (Image Books, page 52). The next Communion you receive will be the first Holy Communion of the rest of your life. There is no greater privilege in your life than to receive Jesus in Holy Communion. “If you only knew the gift God has for you….” (John 4:10). Reference: The material for this note comes from the books referenced in the note. John 4:10 refers to the living waters of baptism (the prelude to the gift of the Eucharist). See Ignatius Catholic Study Bible, page 168. 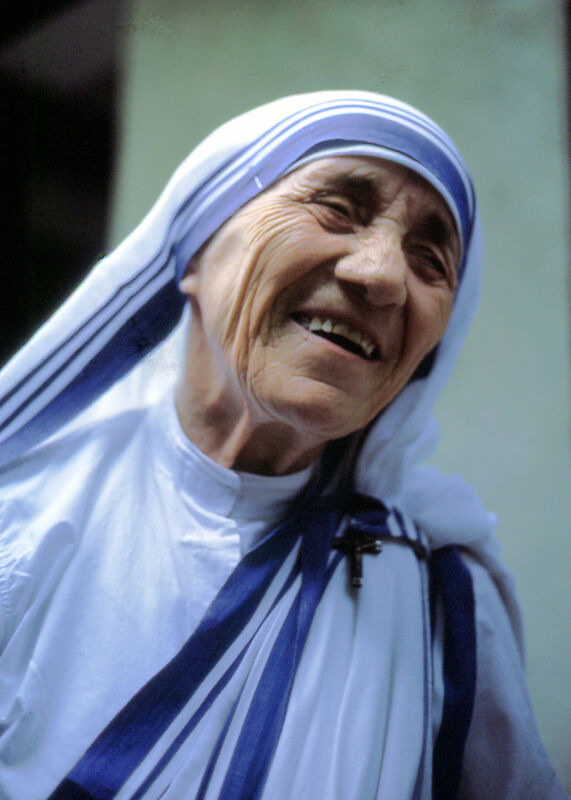 Photo attribution: The photo above of Mother Teresa is by Manfredo Ferrari, December 10, 1985, in Rome, available under a Creative Commons Attribution-Noncommercial license (per Wikipedia).